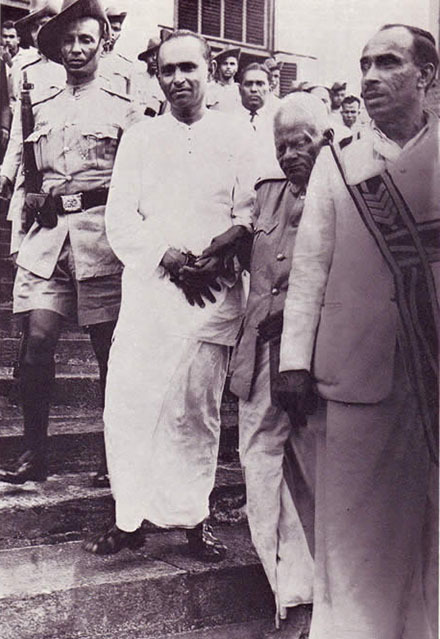 Exploiting the prerogatives of clergy, Somarama obtained a September 25, 1959, meeting un-screened by security for one of the Prime Minister’s public-audience days, a revolver secreted in his saffron robes. 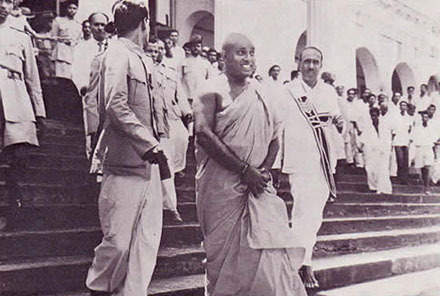 When Bandaranaike knelt ceremonially to the monk, Somarama shot him in the stomach. The wound was mortal, but the Prime Minister lingered on all that night — long enough even to give a televised address from his hospital bed asking his countrymen to “show compassion to” his assassin “and not try to wreak vengeance on him.”* Only months before the murder, ethnic riots had devastated minority Tamil communities, and another pogrom might have been averted on this occasion only the quick thinking of a government official to promulgate immediate word that the assassin was not Tamil. Ironically Buddharakkitha was so far above suspicion at that he was solicited for a broadcast eulogy of his victim. One can only imagine his relish at the performance — but it was not to last. Buddharakkitha was tried as a conspirator for orchestrating Somarama’s deed, dodged a prospective death sentence, and died in 1967 serving a prison sentence at hard labor. Bandaranaike’s daughter Sirimavo succeeded him as Prime Minister in 1960, becoming the world’s first elected female head of government. A second daughter, Chandrika, and a son, Anura, have also been prominent Sri Lanka politicians. * Buddharakkitha, also noted for exploring paths to enlightenment with various Sinhalese elites’ wives, was the high priest of the Kelaniya temple — which is the titular temple in the 1953 Sinhalese nationalist tract The Revolt in the Temple, “a blunt statement that the Tamils are a threat to [the Sinhalese] historic mission.” Its author was Don Charles Wijewardena, who had been a patron of Bandaranaike as a young monk; the (still-extant) Wijewardena dynasty had likewise associated itself with the Kelaniya temple itself, the political and the devotional mutually reinforcing one another. The Sinhala-Tamil conflict stoked in these years has progressed in the decades since to ever-bloodier consequences.